Benchmark Email iPhone App Now Available in Apple App Store! Today is an exciting day for Benchmark Email. We are so ridiculously excited and proud to announce the launch of our Free Mobile Email Marketing App. A lot of hard work, blood, sweat and tears went into the making of the App, and many thanks go to everyone on our Benchmark Email teams across the globe for making it happen. What’s even more exciting? You have the chance to win a $10,000 App Store Gift Card for downloading our App. That’s right. Apple is anticipating an exciting benchmark (see what I did there?) of their own. 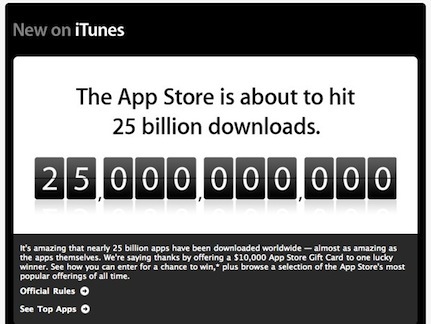 The App Store is anxiously awaiting the 25 billion downloads mark. To celebrate, they are giving away a $10,000 App Store Gift Card. All you have to do to be eligible to win is download an App from the App Store. If you’re the 25 billionth downloader when you download the incredible new Benchmark Email iPhone App, you can win a $10,000 App Store Gift Card. That’s not even mentioning the extra revenue you can generate by leveraging the App for your email marketing efforts. We’re so excited about the App, and confident you will be too, that the App Store may be launching a contest for 50 billion downloads before too long! Download the Benchmark Email iPhone App. 25 Billion Apps Countdown Promotion Rules.